The human Predators were resourceful people who donned Yautja armor and weapons. Some of them even received great respect from the Predators and become blooded. There are a few instances of humans fighting alongside Yautja and even hunting together. Here is a list of notable human Predators from comic books, games and movies of the franchise. They are ranked by their skills and hunting successes. The Predator Killer mech suit was a gift to the humans from the Predators. The motivations for that are complicated and involve a Predator civil war, global warming, an invasion of Earth and DNA extraction from spines. Although the first human to wear the suit was a helpless scientist, Quinn McKenna took over the testing and usage of the suit. We never see that in the movie, but it is heavily implied. McKenna also used some of the Predator tech during his previous encounter with the Yautja, including cloaking orbs. It is worth mentioning that Quinn's son also became a small Predator by wearing the Fugitive Predator's bio-mask. Gisande Salazar was the chief of corporate security for Montcalm-Delacroix, a big corporation in the Aliens vs. Predator: Deadliest of the Species comic series. 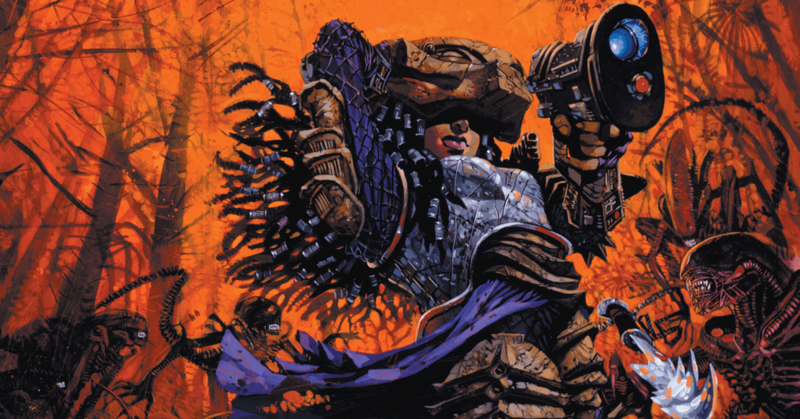 She teamed up with Ash Parnall and the Predator nicknamed Big Mama and turned on her employers. Big Mama provided her with Yautja equipment and actually trained her to become an efficient Xenomorph killer. Like Caryn Delacroix, she was genetically engineered with faster reflexes and healing. In the end, she survived her ordeals and escaped together with Big Mama and Ash Parnall, never to be heard from again. The character of Alexa "Lex" Woods from the first Alien vs. Predator movie drew several parallels with Machiko Noguchi. She was an adventurous loner who led a Weyland Corporation expedition to Antartica to investigate an ancient pyramid. She encountered both Aliens and Predators and successfully fought against them. Lex impressed Scar Predator with her skills and was blooded by receiving an acid scar from a facehugger on the cheek (Machiko was blooded on the forehead). She did not wear any Predator armor but received a ceremonial dagger from the Elder Predator after killing the Alien Queen. It was a missed sequel opportunity for her not joining the Predators at the end of the movie. Her final fate is unknown but a sequel comic would probably not be out the question for her in the future. Hunter Borgia was the CEO of Borgia Industries and an important member of the Borgia family. Having a convenient name, he wanted to become a human Predator after coming into contact with them as a small boy. Hunter was perhaps also influenced by Charles Bishop Weyland, a close friend of his. He experimented with Yautja blood and genetic engineering and became a Yautja-human hybrid. He also donned Predator armor and weapons, although he did not wear a bio-mask. Hunter Borgia's experimentation came to end before it could be finished, as he was killed by Scarface Predator. This all happened in the quite underrated Predator: Concrete Jungle video game. Ronald Noland was a US soldier who lived on the Game Preserve Planet for a long time. He became a human Predator himself by salvaging Predator tech and weapons. There is conflicting information about him killing any Predators, but supposedly he took down 3 of them before the events of the Predators movie. However it seemed that some of his human sanity was lost in his exile, and he turned on his newly found comrades. Concocting an ill-advised plan involving smoke, he failed to kill any of the humans and become prey to the Super Predators. Shane Burroughs and his brother Charles were stuck on a colony world for several months after their transport ship was destroyed by the Predators. Having defeated a Predator, Shane acquired a Predator mask and armor from the fallen Yautja before the self-destruct mechanism was triggered. The brothers hunted Xenomorphs together, with Shane using the Predator equipment and Charles providing fire support with his sniper rifle. Their fun and games were cut short when Shane's Predator armor was damaged by Xenomorph acid and the Predators returned to the colony to capture all the humans. After several reversals involving a Xenomorph Queen and a group of androids, the brothers successfully escaped the colony world and the Predators. Shane Burroughs and his brother appeared in the Alien vs. Predator: Thrill of the Hunt and Civilized Beasts comic series. Royce did not really become a human Predator in the Predators movie. This happened later in the Predators: Preserve the Game sequel comic. Having lived together with Isabella on the Game Preserve Planet for several months, he was getting in touch with his primal side. Royce also received a gift from the Predators - Predator armor together with a bio-mask. This allowed him to defeat the four-armed Predator, one of the biggest Predators ever known. By the end of the story, he was still stuck on the planet and it would be great to see him again in Predator lore. Buddy Wilcox had his father killed by a Predator when he was still a young boy. It happened on a hunting trip right in front of his eyes and traumatized him for life. Thirty years later, the same Predator came to terrorize the small Northwestern town in Oregon where Buddy lived. The Yautja killed several men in the town and set his sights on the police station. This time, Buddy was prepared and donned Predator armor and weapons that he built himself. He successfully defeated the Predator in a duel and saved the town. 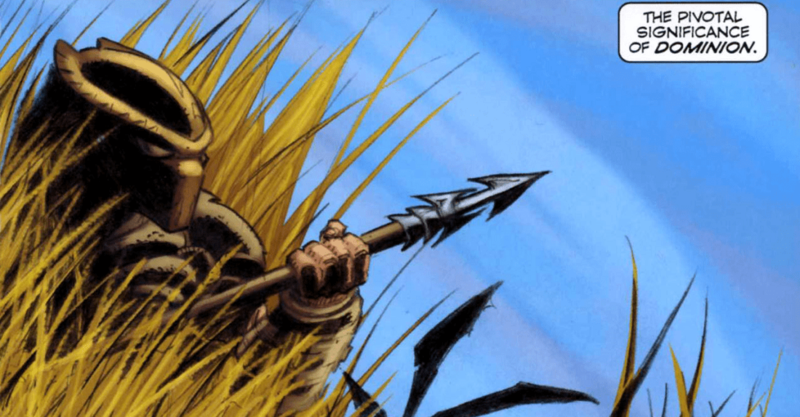 Buddy Wilcox appeared in the Predator: Kindred comic, released in 1997. Ash Parnall, also known as Caryn Delacroix, was a complicated person who appeared in a complicated comic: Aliens vs. Predator: Deadliest of the Species. She started as a genetically engineered trophy wife to Lucien Delacroix. She crossed paths with the Big Mama predator who became a mentor of sorts for her. Big Mama trained Ash Parnall in the arts of Predator technology and weapons. They assembled a small team of other human Predators and fought against Xenomorphs, white-hybrids and an AI construct nicknamed "Toy". Throughout the story, the appearance and personality of Ash Parnall changed several times, bending dreams, reality and virtual reality. Through her adventures were at times difficult to follow, Ash Parnall was a memorable protagonist and a great human Predator. Machiko Noguchi is the most well known and badass human Predator. She was also the first, appearing in the initial Aliens vs. Predator comic line released in 1989. One of the few human to be blooded by a Predator (namely Dachande), she fought alongside a Predator clan for over a year. The Yautja respected her for her skills but some of them also showed distrust. This distrust and her longing for human contact led to her being ousted from the clan. She had more adventures after leaving the Predators which are featured in Aliens vs. Predator: War and Aliens vs. Predator: Three World War. Another human Predator worth mentioning is Hish Mannen, who appeared in the ill-received Predator: Forever Midnight book. He was brainwashed by the Hish Qu Ten (another name for the Yautja) to become one of their slaves. For a while, Mannen believed he was a Predator himself and even saw flashbacks of the Predator homeworld. Want to know more about the Yautja? Check out the list of the most Biggest Predators and look over the different Predator Trophy Walls.